I am coming from out of town, where can I stay? Check out these fantastic lodging options we have for you, your friends, and your family! Who can I call for a ride if I can’t find a parking spot somewhere? Check out these taxi services in the area. Have you ever cancelled the games due to lack of snow &/or ice? NO! The games have never been cancelled as we can play on or off the ice! PLEASE DO REMEMBER THAT NO ICE IS SAFE ICE. Contact the DNR (712-336-1840) with any relevant questions. What should I expect at the Polar Plunge? – The Polar Plunge takes place on the ice by Arnolds Park Amusement Park on the Saturday of Winter Games. Registration begins at 1:30 pm and ends at 3 pm. Please have a friend or family member hold your dry clothing and belongings. Bring a towel and a sense of courage as people begin jumping into the frozen waters of West Lake Okoboji at 3 pm. Cost is $20 with proceeds going to benefit the Arnolds Park Okoboji Fire & Rescue Department, those volunteers who are always on-hand to pull you out of a bad situation! 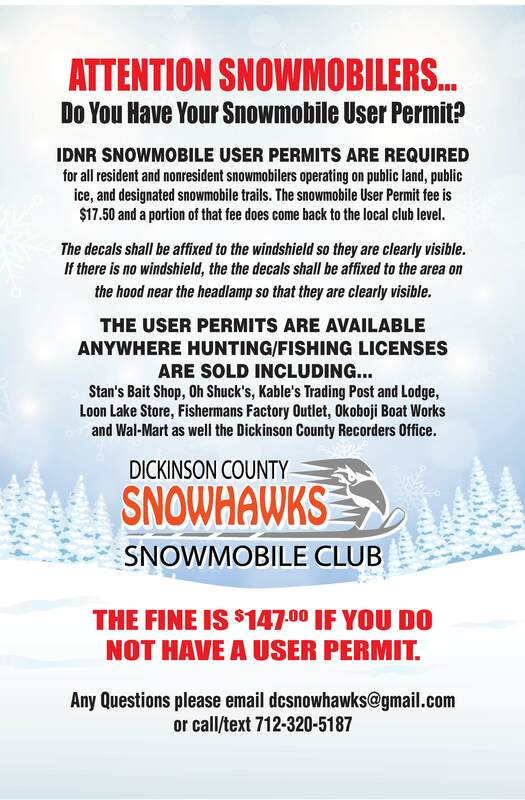 Do I need a State of Iowa User permit for my snowmobile and/or ATV? Yes! – IOWA RESIDENTS: all snowmobiles must have a user permit, yet OHV’s are not required to and proof of insurance required on all vehicles. 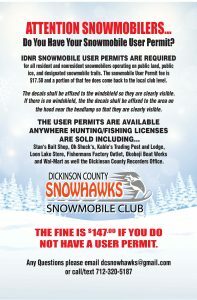 NON RESIDENTS: all snowmobiles and OHV’s must have user permits & proof of insurance required. User permits can be purchased at the Dickinson County Recorder’s Office in the Courthouse on the corner of Hill Avenue & Hwys 9/71 and anywhere hunting & fishing licenses are sold (Hy-Vee Food Store, Sunshine Foods, Kabele’s Trading Post, Oh Shucks Bait Shop, Wal Mart, Fisherman’s Factory Outlet and Stan’s Bait & Tackle). Where can I obtain a list of activities for the weekend? Check out the Schedule page on this website, www.lakesnewshopper.com and www.exploreokoboji.com.